A little more than two weeks ago, the Atlanta Braves seemed to have the National League Wild Card race sealed up as they led the St. Louis Cardinals by 8.5 games. Now with a week to go until the regular season finale, they only lead the Cardinals by 2.5 games now. Could they actually blow away the lead down the stretch? The Braves' offense has not been great this year, currently 19th in MLB in runs scored, thanks to a multitude of players having mediocre years most notable Jason Heyward and Dan Uggla. The starting pitching has been un-Braves like all year having struggled with injuries (Jair Jurrjens and Tim Hudson are out) and they have struggled to pitch deep into games. Fortunately their bullpen has been ridiculously good this year as Johnny Venters and Craig Kimbrel have been lights out so that has not been a problem, until now. 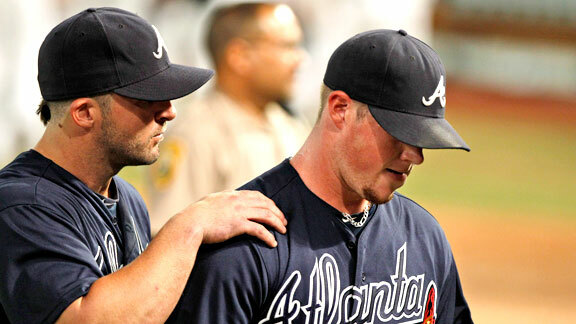 The Braves like to work their relievers hard and it appears they might be wearing down. Kimbrel's last appearance, on Monday night against the Marlins, could be a sign of things to come where he gave up a game winning home run to Omar Infante and helped put the Braves in this predicament. The Braves, after tonight's finale with Florida, do have a three game set with Washington and one with Philadelphia, who does have nothing to play for. Unfortunately for Atlanta, the Cardinals' remaining schedule is a joke. They have two more games in their set with the Mets then a series with Chicago and one to close out with Houston. And the Cardinals are hot as Albert Pujols has been absolutely raking at the dish (big time shock), the starting pitching has been solid as the consistent Chris Carpenter has led the way and Edwin Jackson has been not awful of late, and the bullpen has performed well of late. The Cardinals are absolutely a major threat for the Braves now. The Wild Card races in both leagues have become suddenly excited as the Braves and the Red Sox have been performing like Labatt Blue of late. Whilst I feel that the Red Sox will make it, I think there is a real serious shot the Braves miss out.